Buddhism arose in a century of intellectual ferment – the Buddha and Socrates were contemporaries – and, as did all historical religions, passed through feudal, ecclesiastical, and aristocratic social periods, all of which inevitably influenced its expression. Historical Buddhism is like all things, a phenomenon, and is therefore subject, understood as a phenomenal object, to the same laws as ground all other beings, i.e., no-self, mind-only, flux, and suffering. What we perceive as “Buddhism” – which does not even correspond to a word that the Buddha used – is the effect of dharma on human history, not the dharma itself. Dharma itself is reality itself, which is by definition trans-historical and trans-dual. Time itself is grounded in timelessness. Dharma is experienced and in that experience it is understood. Indeed, the understanding of dharma is perfect understanding, metaphysical omniscience (“complete information”). It is (em)power(ment), wisdom, and bliss. But the trans-dual cannot be expressed by dualistic, analytic, verbal language, nor comprehended by the rational ego-logical mind, except by means of the symbolic. The moment it is so expressed, it becomes a phenomenon, and so the dharma of reality, which is singular and whole, becomes historically, geographically, linguistically, and psychologically differentiated, separated, false. The fundamentalist religious project is to attempt to reduce the totality to the source, and hold it there, as if in stasis, for ever. The fact that this is impossible is lamented. The grip is tightened. Fundamentalism asserts total control. This is tolerated because creativity is not required. The goal is annihilation, not art or progress. Time is against us. Even Mahayanists hold this false view, false because it is contrary to the law of flux. It expresses attachment to a phenomenal manifestation of the dharma, and implies non-cognition of the underlying truth. Therefore it is a non-dharmic and even anti-dharmic view. It is a mistake to think that dharma is subject to time. Just as timelessness grounds time, so does dharma ground the phenomenal. So it is not dharma that changes and weakens, it is its phenomenal manifestations. Dharma itself is not found in phenomena, but is always potentially present and accessible even in its inaccessibility. Just as the non-phenomenal arises within the phenomenal as the dissatisfaction arising from suffering, leading to wisdom and finally emancipation, so dharma may not be found in phenomena, but within phenomena, as it were, through the discernment of recurrent patterns of association – meanings – symbols – of ever greater subtlety, using the method of logical syncretism. Even though the trans-dual can never be comprehended directly by reason, an intuition thereof can be achieved through the dialectic of opposites, which C.G. Jung referred to as the transcendent function. The essential nature of the transcendent function is purely energetic, and therefore endless, eternal, timeless. Finally, all this is transcended in the ultimate realization that Wisdom is the realization of emptiness, which is emancipation itself, remembering that “emptiness” does not exclude but includes the whole. Padmasambhava appeared at the navel of the world, the meeting point of East and West, and impregnated Tibet to the East with His essence, where it gestated in secret for twelve centuries. Out of Tibet’s labour the Dalai Lama emerged into the West in 1959 of the common era. The Tibetan diaspora carries the spores that will bring the Buddhadharma into, not merely the West, but the rest of the world, and die, only to be reborn. This event occurs at a pivotal moment in human history, when science has exploded the truth of all human religions and prepares to catapult mankind into the era of technocracy, when human beings, mired in ignorance, desire, and suffering, will be entrusted with the control and administration of the greatest power in human history. In the face of such a momentous challenge only two possibilities present themselves: radical reaction or human transformation. Since the former is impossible, there is only one alternative: the future civilization of the world, predicted in the last Tantra, the Kalachakra, is the fusion of Buddhism and technocracy. 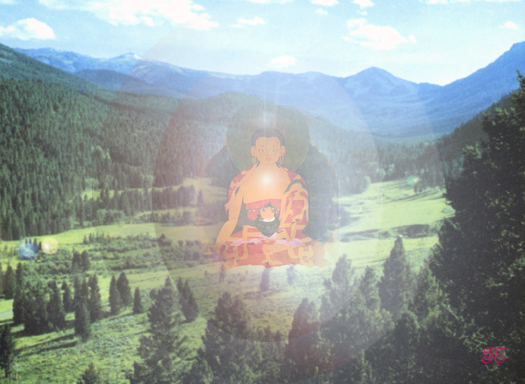 In the Kalachakra this society is referred to as Shambhala, and is prophesied to manifest fully in the year 2424. Based on ancient prophecies, the Kalachakra explicitly identifies Shambhala as a high-tech society the inhabitants of which are light/energy bodhisattvas. The Buddhism of the future will not be the Buddhism of the past. It will be a Buddhism that incorporates and through incorporation reconciles all phenomenal manifestations of dharma. This will be achieved intellectually through the electronic collection, translation, and collation of all dharma realizations wheresoever and whensoever expressed. Dharma is the sum total of all realizations of dharma. There is no contradiction between dharma and science. Science itself testifies to the truth of dharma. There is no conflict between dharma and religion, because dharma is the essence of religion. There is no conflict between dharma and modernity, because dharma is the ensurer of the future of man. Without dharma, technocratic man is sure to commit collective self-annihilation. Also the source of the Kalachakra itself. Padmasambhava’s appearance in Tibet corresponds to the midpoint of history, 1,200 years after the Parinirvana of the Buddha, and 1,200 years prior to the advent of the 21st century C.E., further attesting to the profound significance of our own time, as predicted in the Mahaparinirvana Sutra. Cf. the Pure Land on Earth Movement.